Filmed live in the composer’s birthplace of Bergamo at the 2016 ‘Festival Donizetti Opera’, here we have Paola Rota’s new production of Rosmonda d’Inghilterra. From Teatro Donizetti this new revision is based on autograph and primary sources by Alberto Sonzogni for the Donizetti Foundation and this is the world première recording in this form. Just prior to this Bergamo staging, concert performances of the Sonzogni score were given in Florence with essentially the same cast (apart from a different Enrico). Buoyed by the great success of Lucrezia Borgia in 1833 at Teatro alla Scala, Milan Donizetti the next year quickly wrote the opera seria Rosmonda d’Inghilterra to a libretto by Felice Romani based on the legend of Rosamund Clifford (The Fair Rosamund) the mistress of Henry II of England. First performed in February 1834 at Teatro della Pergola, Florence Donizetti partly revised the score in 1837 as Eleonora di Gujenna evidently for Naples. Virtually forgotten the score to Rosmonda d’Inghilterra was rediscovered in 1975 by Patric Schmid, co-founder of Opera Rara, who had recognised Donizetti's handwriting on the manuscript in the library of Naples Conservatory. Set in England during the Middle Ages in and around Woodstock Castle Rosmonda d’Inghilterra is a gravely serious work. Famous in English legend the tragic love story of King Henry II (Enrico) of England and Rosamund (Rosmonda) is widely known providing great scope for poets and writers over the years. Clifford’s daughter Rosmonda, mistress of Enrico is kept virtually prisoner, away from prying eyes, in the tower of Woodstock castle. In the concluding scene Leonora (wife of Enrico) brutally murders Rosmonda. It is meagrely directed by Paola Rota and his set and light designer Nicolas Bovey, who have provided a dark and rather dingy staging which feels as dispiriting as the ending is vicious. Such a tortured and anguished atmosphere makes it obvious that sinister and cruel machinations are afoot. Virtually bathed in permanent darkness to focus the action centre stage the set has little in the way of noticeable scenery and just the odd period prop used for various scenes such as a single chair, table, a freestanding doorway and pink and yellow petals scattered on the floor. Oh, I mustn’t forget the curious use of, strictly non-period, black umbrellas used by some of the male chorus with the women members carrying oversized single gold roses. The only relief is provided by the mainly period costumes designed by Massimo Cantini Parrini predominantly colourful, unwaveringly elegant in design and beautifully decorative. Bovey’s lighting scheme keeps everything in near darkness ensuring Parrini’s period costumes for the five principals are virtually imperceptible to the eye unless they are spotlit. The only real surprising item of clothing worn by the principals is Leonora’s comical and voluminous black hat that looks like an upturned bucket. There is no period dress for the chorus, which is consigned to wearing ludicrous, unflattering and most impractical costumes that look like something out a bad sci-fi film, notably long black robes, with tight fitting black latex wigs and wide gold chest plates for the men and extremely wide brimmed hats with no crown (constructed of elaborate figure-of-eight folds) and chunky gold coloured stone necklaces for the women. Another curious costume feature is the collective wearing of a strip of greasepaint across the eyes with the principals wearing either a black or gold stripe, and black stripes for the chorus. A telling choice for the role, bel canto specialist Jessica Pratt makes a suitably confused and wretched tragedienne Rosmonda, looking striking with her long red tresses and magnificent green robe. Totally committed, her weighty, expressive voice and outstanding coloratura combine satisfyingly with assured acting ability, to meet the dramatic demands of this challenging role. Containing some enchanting florid writing my highlights are Rosmonda’s act I cavatina ‘Perchè non ho del vento’ and also her act II cabaletta ‘Senza pace, senza sperme’ which is graciously sung and attractively phrased with telling drama. As the King Enrico, Dario Schmunck dressed in a crimson and gold fur-trimmed robe and modest gold crown in truth exhibits relatively little stage presence. Compared to the excellence of the other four principal cast members Schmunck, although committed, delivers only an adequate and rather workmanlike performance. Experienced soprano Eva Mei in the part of the jealously wicked Queen Leonora, however, makes another ideal choice. Conspicuous here for her short grey hairstyle and black and gold robe it is a pleasure to hear Mei in such sterling form. Leonora’s act I aria ‘È dessa, Alfin la perfida… Tace ognun! nessun risponde?’ is communicated decisively with insight and subtle colour changes. Nicola Ulivieri, a skilled bel canto performer, radiates an air of authority as the nobleman Clifford. Resplendent in his gold and green, fur-edged robe Ulivieri’s appealing and strongly projected bass-baritone voice is in steadfast condition. In the trouser role of the King’s love-struck page Arturo, mezzo-soprano Raffaella Lupinacci excel, giving an attentively enthusiastic performance conspicuously dressed in a scarlet and gold/green, fur- trimmed robe, with her dark hair tied tightly back. Lupinacci’s weight of voice isn’t comparable to that of Pratt and to a lesser extent Mei, yet her clear, dark-edged tone is combined assuredly with an impressive feeling for the text. Lupinacci’s performance of the marvellous act II scene and aria ‘Che pensi. Arturo?... Io non ti posso... Ritorna a splendere’ is worthy of praise. Under conductor Sebastiano Rolli, the Orchestra Donizetti Opera demonstrates sparkling form. Clearly well drilled by Fabio Tartari the Coro Donizetti Opera, despite its ridiculous costumes, is in fine unified voice. Clear and well balanced, the stereo and surround sound options are well produced whilst maintaining the atmosphere of a live performance. Matteo Ricchetti’s video direction is high quality, providing a variety of shots ensuring the eye doesn’t tire. A small number of brief close-ups did, though, rather take me by surprise. The accompanying booklet contains a useful track listing and there is an informative essay by Mariateresa Dellaborra plus a synopsis. Although not provided here, I always welcome some bonus video footage, namely interviews with the soloists and Paola Rota’s design team. 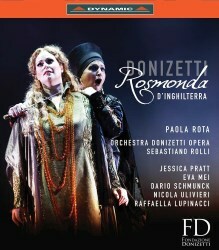 Donizetti’s Rosmonda d’Inghilterra is given an impressive performance with Jessica Pratt and Eva Mei providing significant dramatic impact.